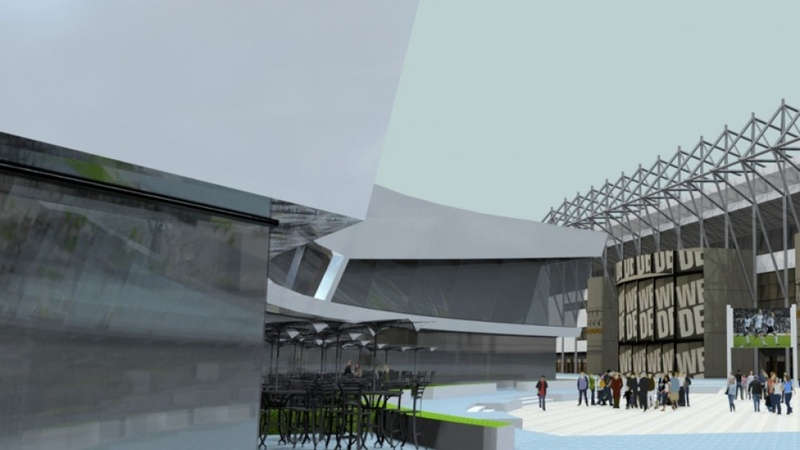 Proposals were to create an enclosed pedestrianised piazza with pedestrian access from South, maintaining full visual aspect of stadium between the new buildings and an open aspect from the North, as seen from Derwent Parade. Proposals were to create an enclosed pedestrianised piazza with pedestrian access from South, maintaining full visual aspect of stadium between the new buildings and an open aspect from the North, as seen from Derwent Parade. A proposed pedestrian link bridge to anticipated multi-sports hub on adjacent site, which approaches stadium in front of existing undercroft, to be developed as a sports bar.